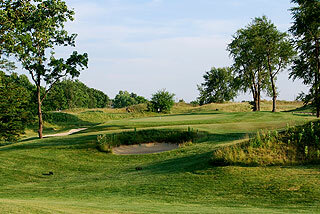 Bear Slide Golf Club in Cicero is an award winning Dean Refram design that has been recognized with 4 1/2 stars out of five by Golf Digest Places to Play. 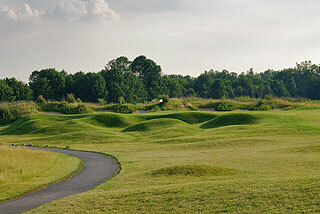 It also has been honored as one of the top 50 public courses in America and 7th best in the state, and Golf Magazine lists it in the top tier of their "must play" list. Golf Digest has also awarded Bear Slide with Top 10 recognition for Great Service and for Great Conditioning. The design is quite interesting, as the front is established as an authentic links style layout with large mounding and tall grasses. The back side features a traditional rolling, wooded layout with doglegs and significant elevation changes. Bunkering is abundant along the wonderfully manicured fairways and greenside, with both deep fescue-lined traps and conventional bunkers present. Golfers should acquaint themselves with the short game area (with sand bunker) on property, as chances are this aspect of play will be needed. 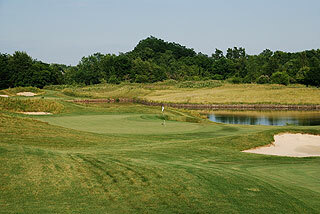 There also is a spacious grass range and large putting green. The clubhouse features a snack area that serves beer, some liquors and hot & cold sandwiches. Banquet/outing facilities are on property, as well as an outdoor patio. The front side is quite open, except numbers one, four and five which feature water hazards that squeeze the landing areas. 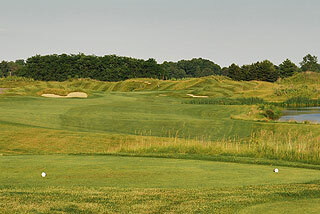 The seventh and ninth play from tees that are noticeably elevated, and the green complex on 8 is situated on a plateau with slopes dropping sharply off on three sides. 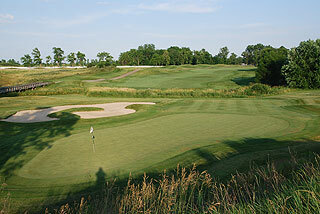 Creeks enter into play near the green complexes on the 10th and 11th holes on the back side, and the twelfth is a gorgeous par five with a pond in play along the left and greenside. Photos of the approach and from behind the green are featured below. 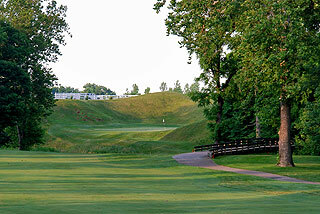 Most of the remaining holes are tree lined, with number 17 doglegging uphill to the left and number 18 doglegging right and back downhill to finish the round. Five sets of tees provide golfers with opportunities to choose from distances and slopes that measure 7041 yards/136 slope, 6629 yards/131 slope, 6029 yards/123 slope, and 4848 yards with a 117 slope. 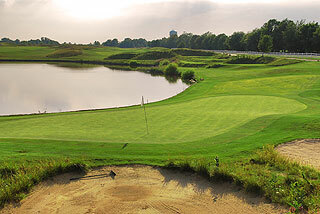 An alternate set - the gold tees at 5145 yards has no rating available. On course cart paths have permanent markings at 100, 150 and 200 yards (250 on par fives), and yardage blocks on the fairways plus sprinkler heads are also measured to the center of the green. Pin placement sheets are provided daily to indicate the hole locations. 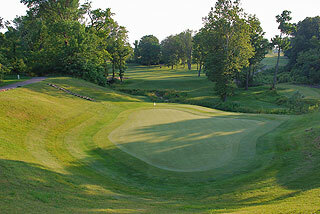 Bear Slide is a beautiful golf facility - one of the best in the area and very highly recommended! The conditioning is exquisite, service and amenities are great, and most golfers will use every club in their bag. For more info, visit our page for Bear Slide with a direct link to their website by clicking here.